A few years ago, Bill J. Johnson, ACP Member, was spending most of his day treating patients for hypertension, diabetes and other chronic ailments. But while he enjoyed his work, his income had stagnated amid tightening insurance reimbursements. That's when he began to think about adding aesthetic procedures to his menu of services. Dr. Johnson is part of a growing number of internists who are embracing aesthetic medicine as a way to counterbalance low insurance reimbursements. Rising interest in medical workshops and seminars suggest that it's an emerging trend. “Fifty percent of our symposium attendees are internists,” said Jeff Russell, executive director for the International Association for Physicians in Aesthetic Medicine (IAPAM), an organization based in Las Vegas that offers support and training programs to doctors looking at adding aesthetic procedures to their practice. Traditionally, dermatologists and plastic surgeons were the go-to specialists for wrinkles, unwanted hair or unsightly leg veins, said Mr. Russell. But internists, ob/gyns and even neurologists, urologists and cardiologists are moving into the business, often as part of their traditional practice. Bill J. Johnson, ACP Member, finds gratification in cosmetic work, which he started as a revenue-builder. With the potential to make $20,000 to $30,000 in profit a month on aesthetic services, “It's quite lucrative,” Mr. Russell said, even taking into account the initial investment of upwards of $250,000, depending on what equipment is purchased. The IAPAM's one-day business plan boot camp teaches practice management issues, from developing a menu of treatments to creating a marketing plan. A two-day symposium incorporates training on botulinum toxin, chemical peels, lasers and other techniques, along with business tips. 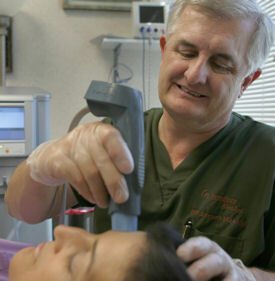 The training focuses strictly on non-surgical cosmetic procedures, said Mr. Russell, and “does not endorse or promote the idea that internists who are not formally trained in cosmetic surgery and board certified in plastic surgery should do invasive procedures.” Doctors also should consider state medical board regulations and their malpractice insurer's guidelines when deciding if and how to expand their practices, he said. Regulations vary from state to state, and medical malpractice companies may differ on their views of certain procedures. Cosmetic procedures are not without risks, mostly minor but sometimes serious. There are documented cases, for instance, of patients dying from complications of liposuction. Mignon Marquina, MD, a family practitioner, said her aesthetic medicine practice, called SkinSuave, in Inglewood, Calif., is increasingly seeing a varied clientele, both ethnically and socio-economically. It's no longer just well-to-do white women who are seeking out cosmetic procedures. Across the country, patient demand for cosmetic procedures is huge and growing. In 2006, there were 1.8 million surgical cosmetic procedures, such as breast augmentation and eyelid surgery, performed in the U.S. and 9.1 million minimally invasive procedures, according to the American Society of Plastic Surgeons. That's a 7% increase from 2005 and a 48% increase since 2000. Topping the list are botulinum toxin injections, chemical peels and laser hair removal. Dr. Kerry Friesen, an ACP Member in Chattanooga, Tenn., said he got into aesthetic medicine largely because of patient demand, and his practice is now 60% general medicine and 40% cosmetics. His services include chemical peels, botulinum toxin injections and dermal fillers, though he's stayed away from laser procedures. “Patients want to be in a doctor's office, not a nail salon,” he said. “I think that is what patients appreciate more than anything else.” He doesn't consider his practice a “medical spa,” but rather an internal medicine practice that offers some cosmetic services. Dr. Friesen said he's enjoyed the challenge of learning more about dermatology and anatomy and finds that doing aesthetic procedures satisfies his artistic and creative bent. “Using Botox is 90% about understanding facial anatomy and 10% about the application,” he said. He also appreciates the added stream of revenue. His patients, for instance, pay $150 for a chemical peel (three treatments are recommended and Friesen pays only a few dollars for the supplies) and $400 to $600 per treatment area for botulinum toxin injections. But he cautioned that aesthetic medicine isn't for everyone. For one thing, generalists considering the move need to be comfortable doing office-based procedures. Zorica Mercadante, MD, an internist in West Long Branch, N.J., used to be part of a busy multi-doctor practice with a demanding hospital component. After the practice broke up, she went into business for herself and now offers treatment for wrinkles, fine leg veins and hair removal using an $80,000 laser that she leases with an option to buy. “This was a fun way of adding on revenue without adding the emotional burden,” said Dr. Mercadante, who is a diplomate of the American Board of Internal Medicine. At first she advertised her laser services in the newspaper and through direct mail, but now patients come mostly through referrals from other patients or other doctors. Dr. Mercadante said she loves practicing internal medicine and would never give it up, but she also gets a lot of pleasure from the aesthetic side of her practice.